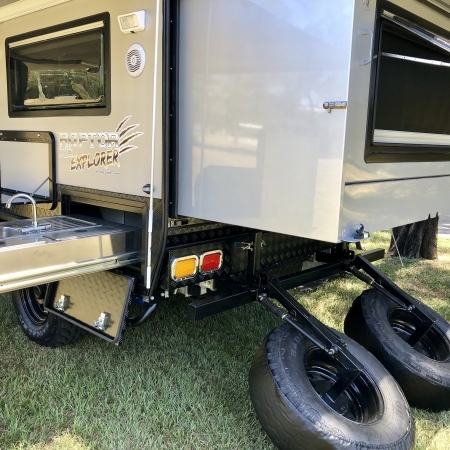 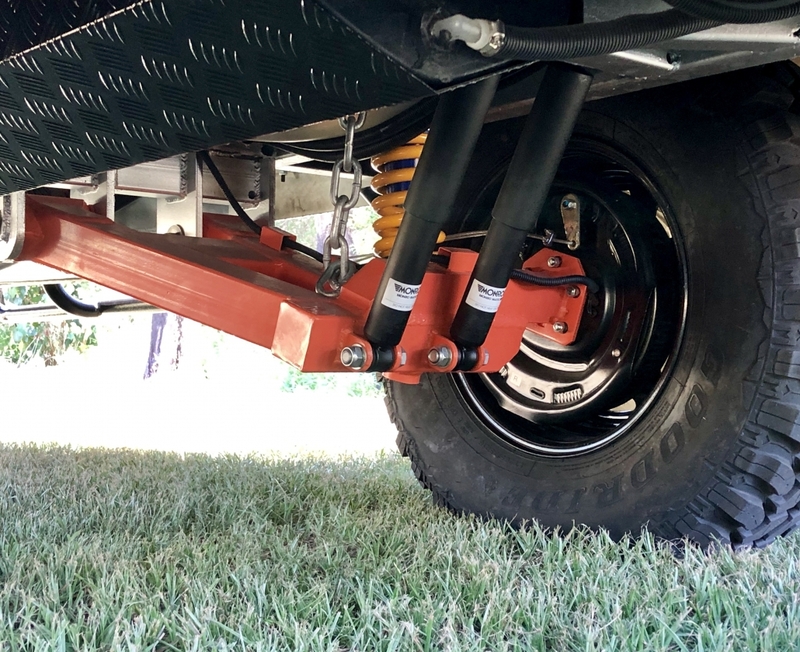 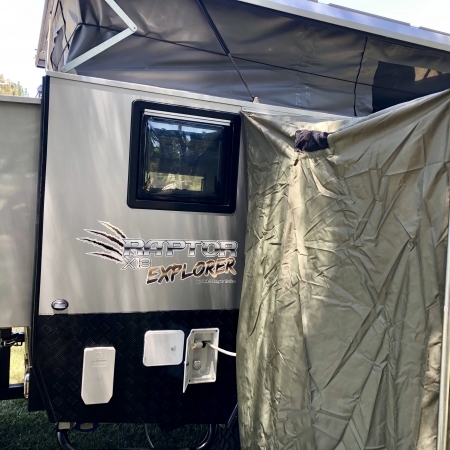 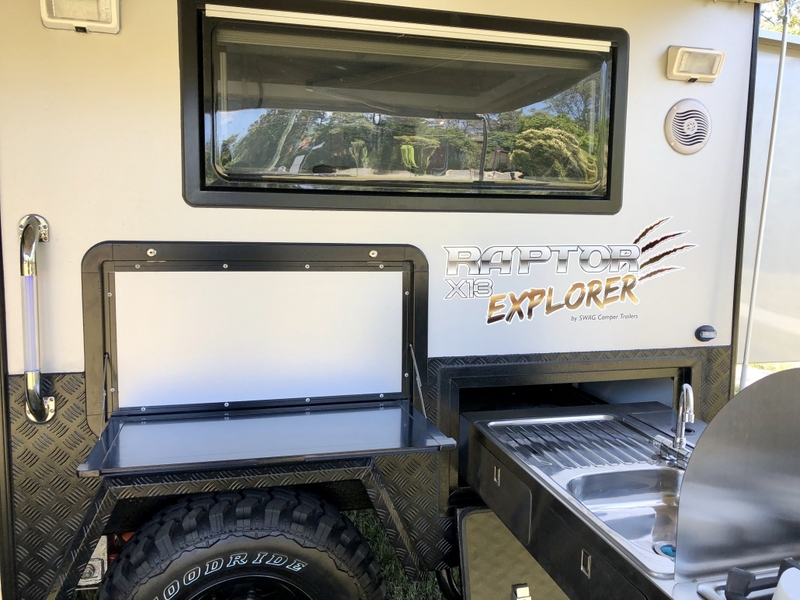 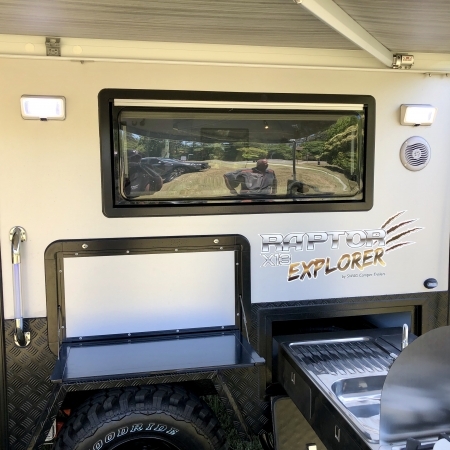 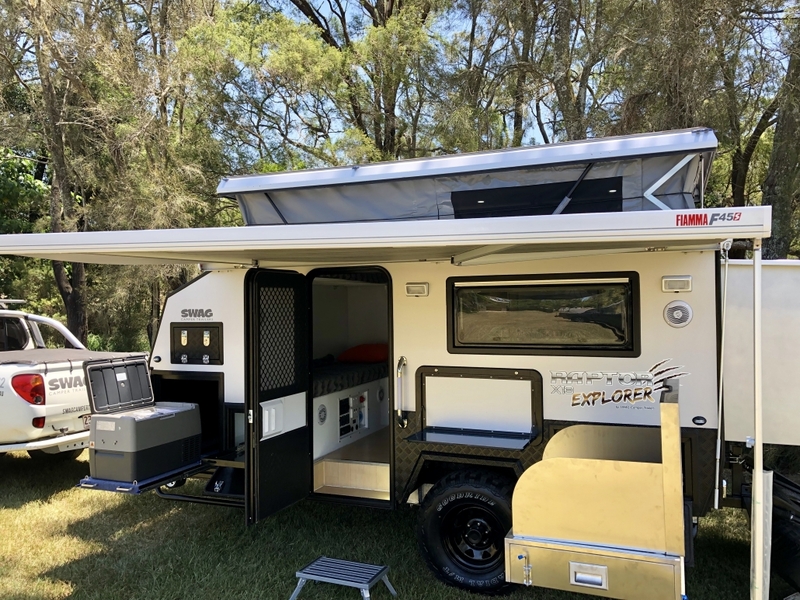 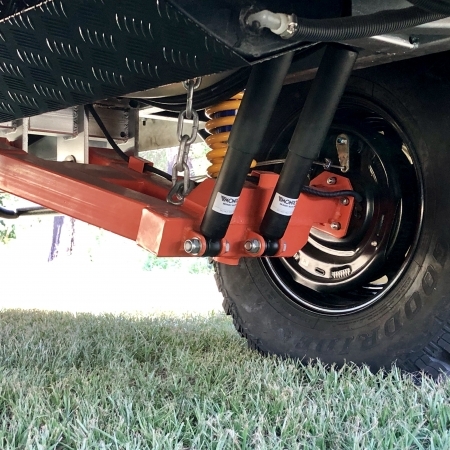 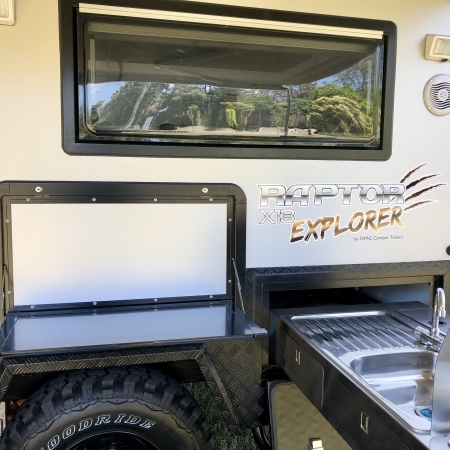 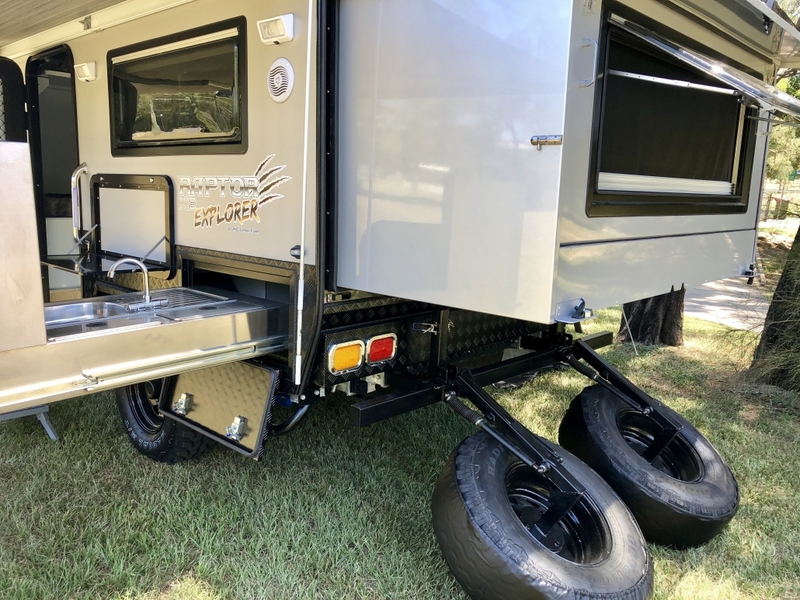 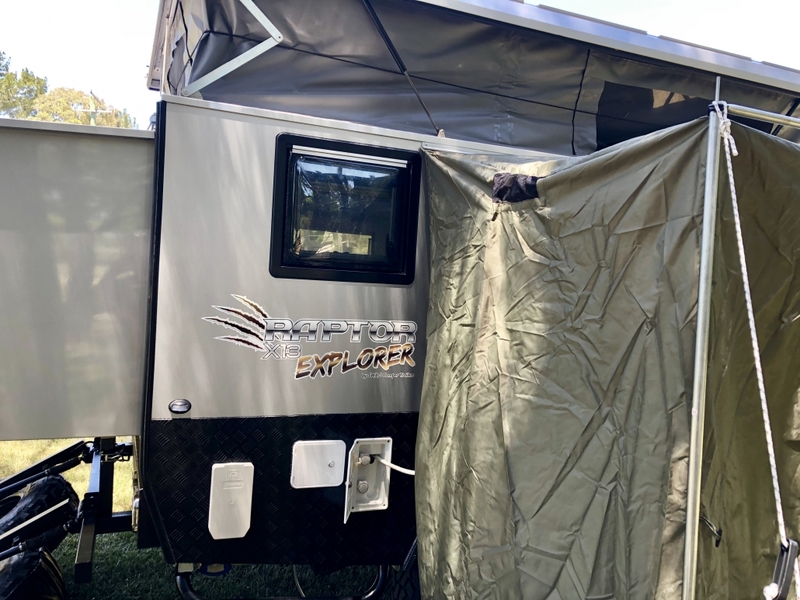 To be honest, when I read that SWAG Camper Trailers had a new 13 FT Hybrid Van that could be configured with up to 6 berths I thought ”How cramped will this be.” To my surprise, the new Raptor X13 Explorer Hybrid is anything but. 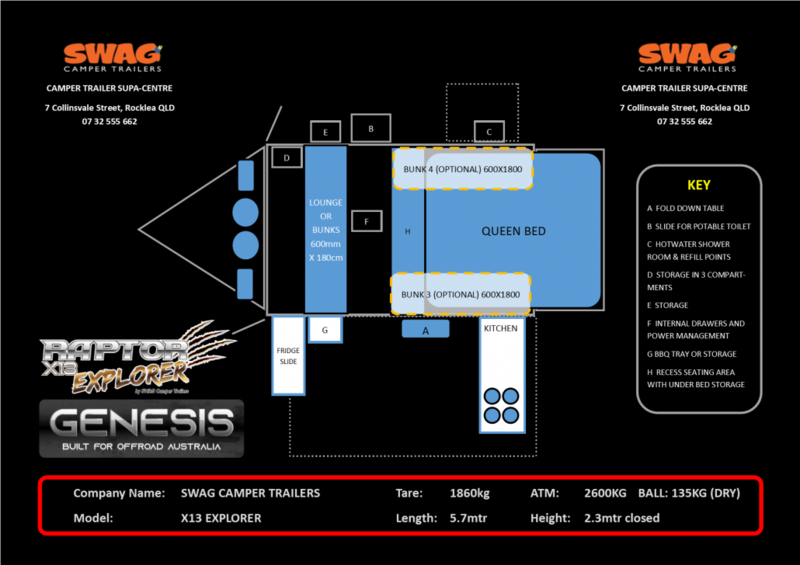 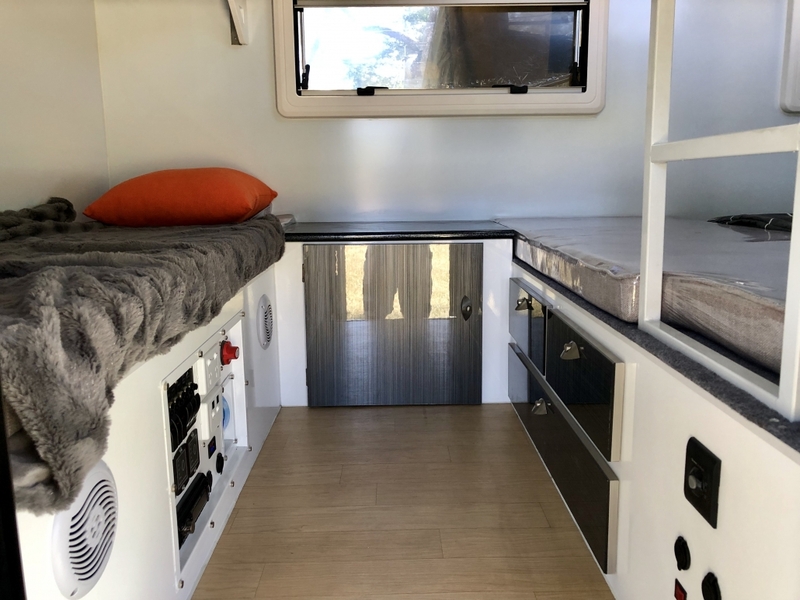 The layout is smart -The options are plentiful and the capabilities are endless. 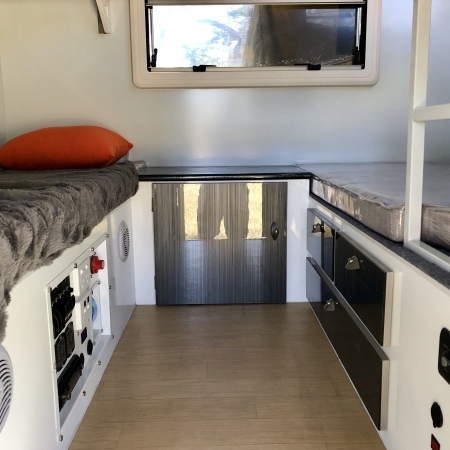 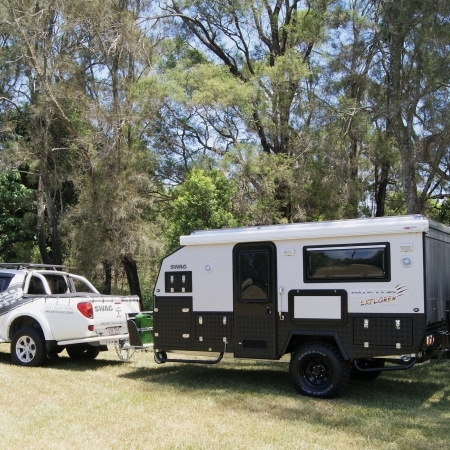 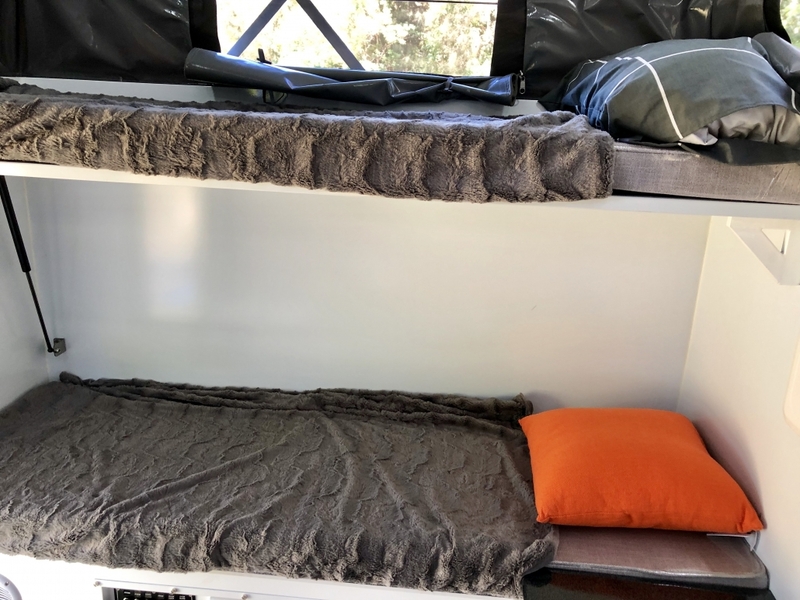 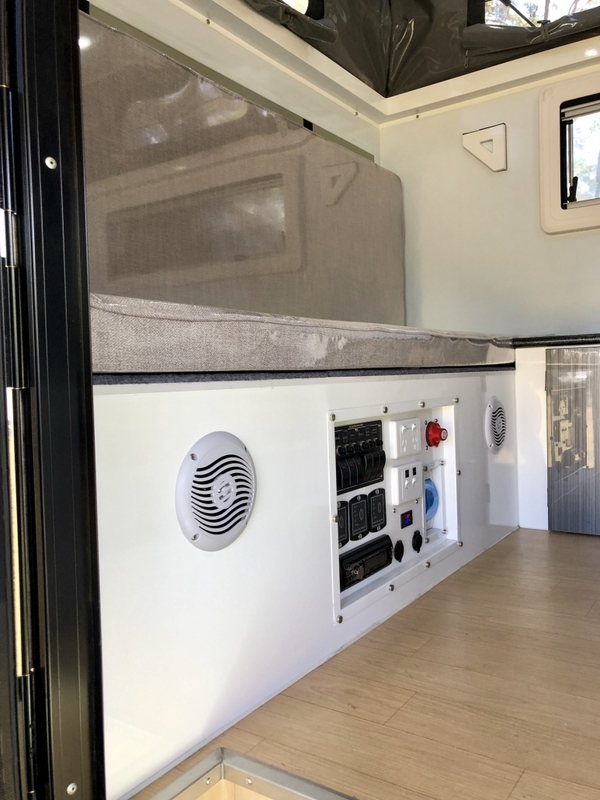 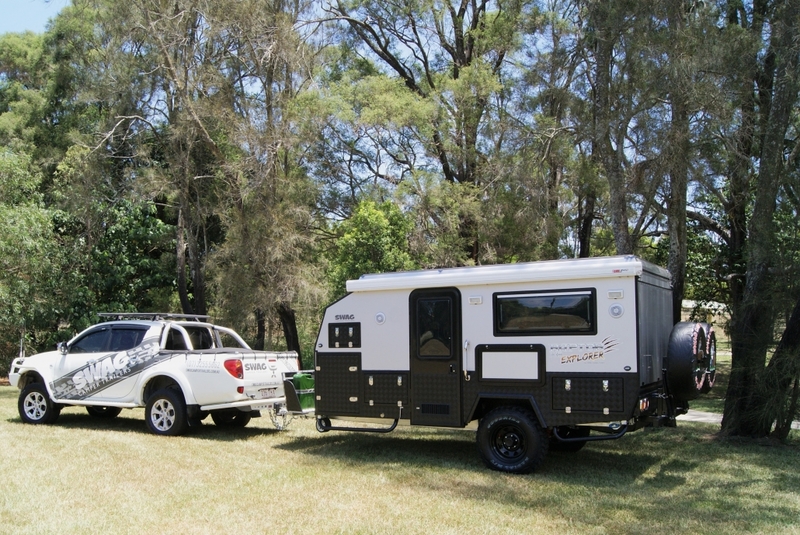 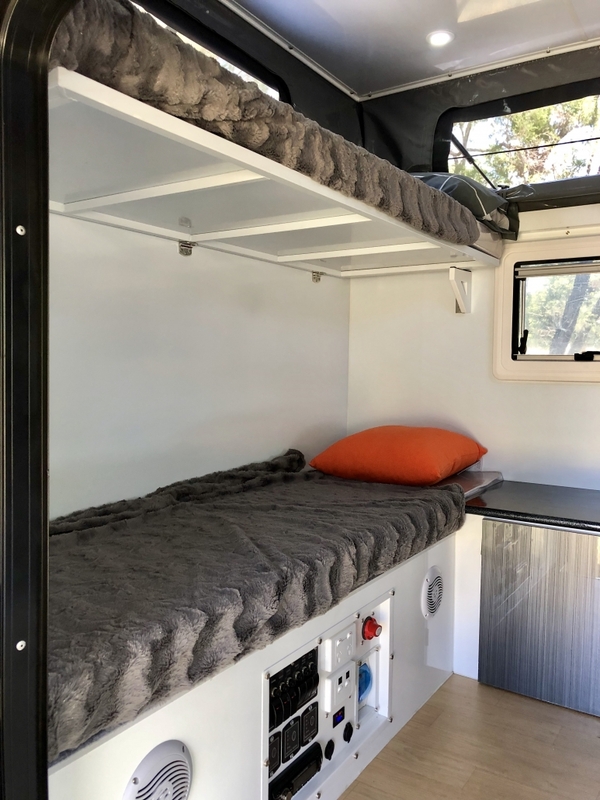 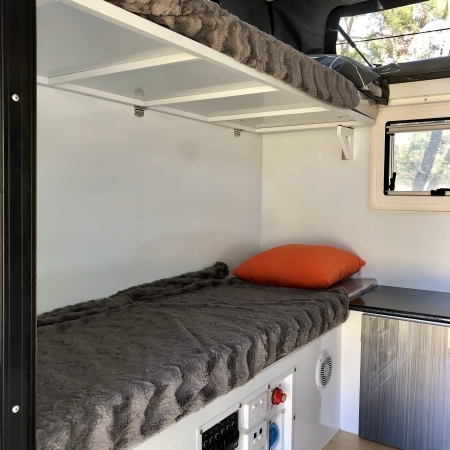 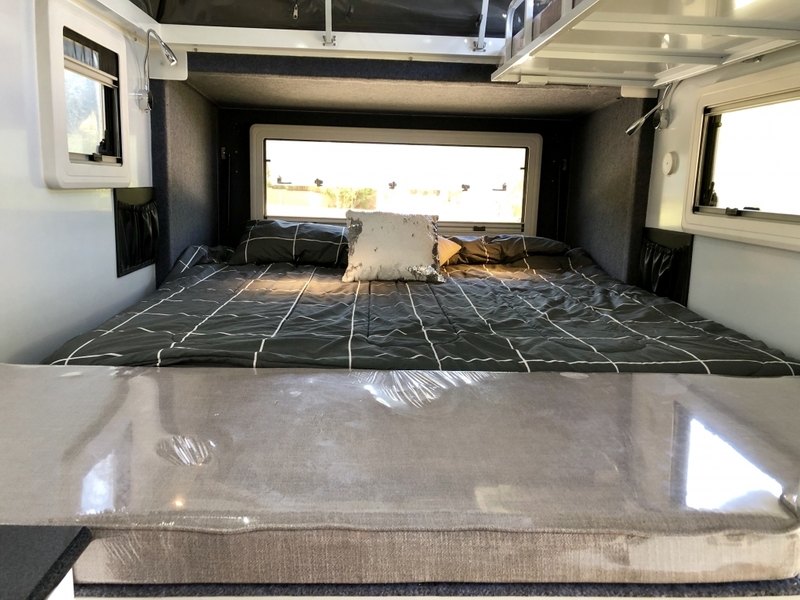 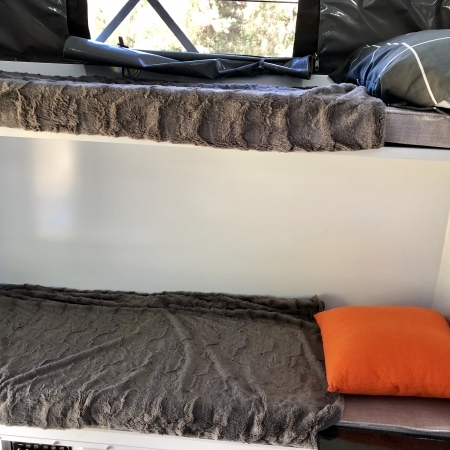 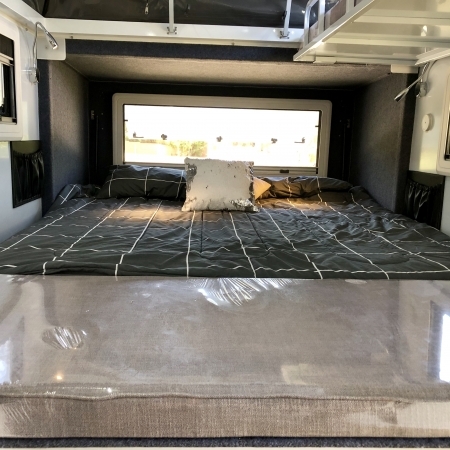 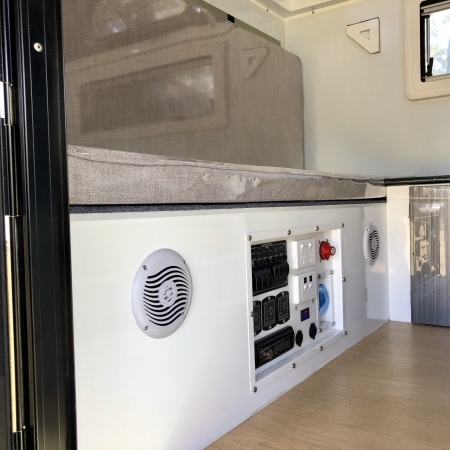 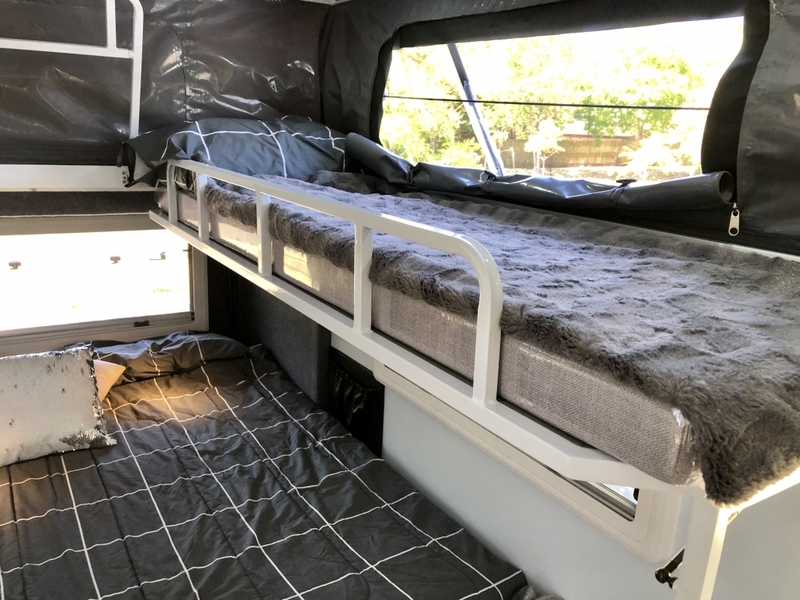 With a full king/queen size main bed and up to 4 -60x180cm bunks internally, the only arguing you will hear from the kids is which bunk they all want. 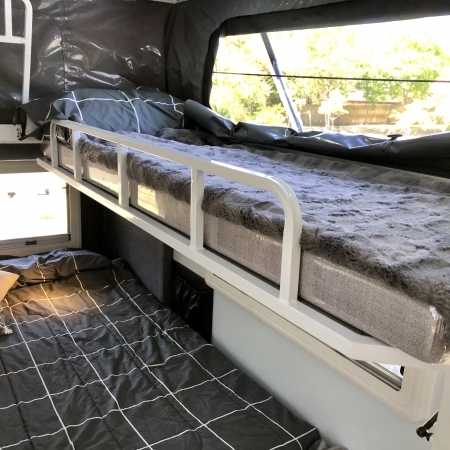 The front bunk also folds down to become a lounge – handy! 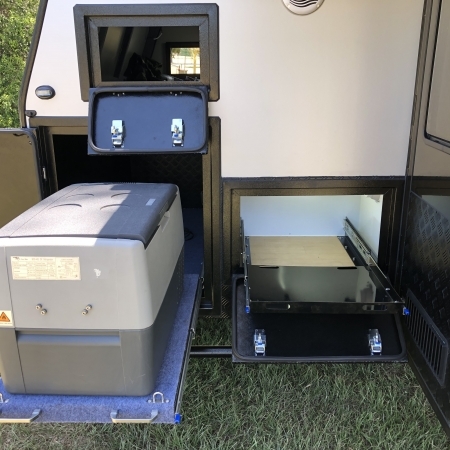 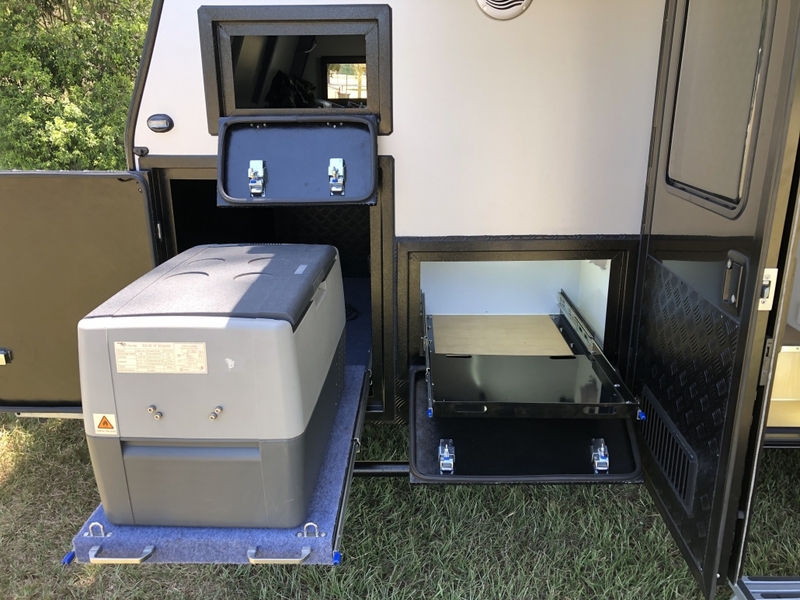 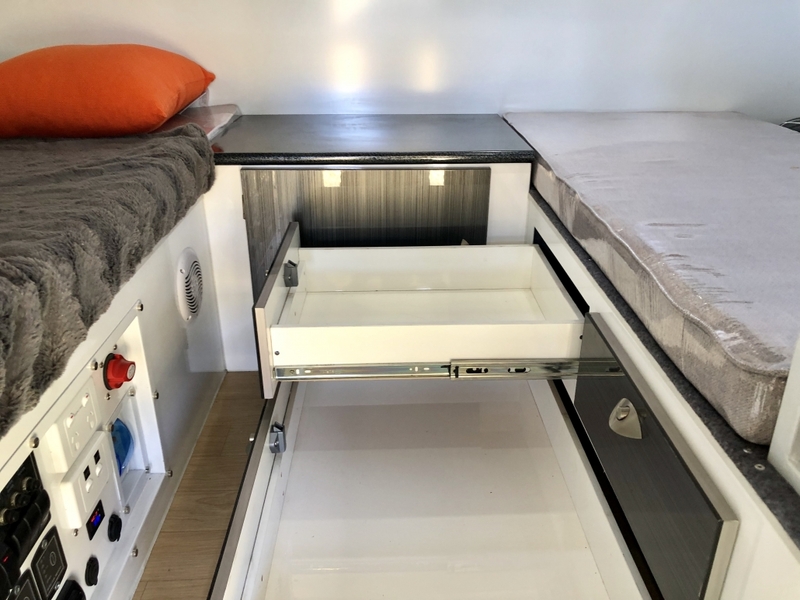 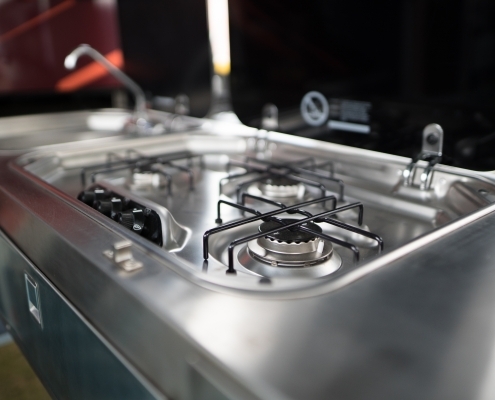 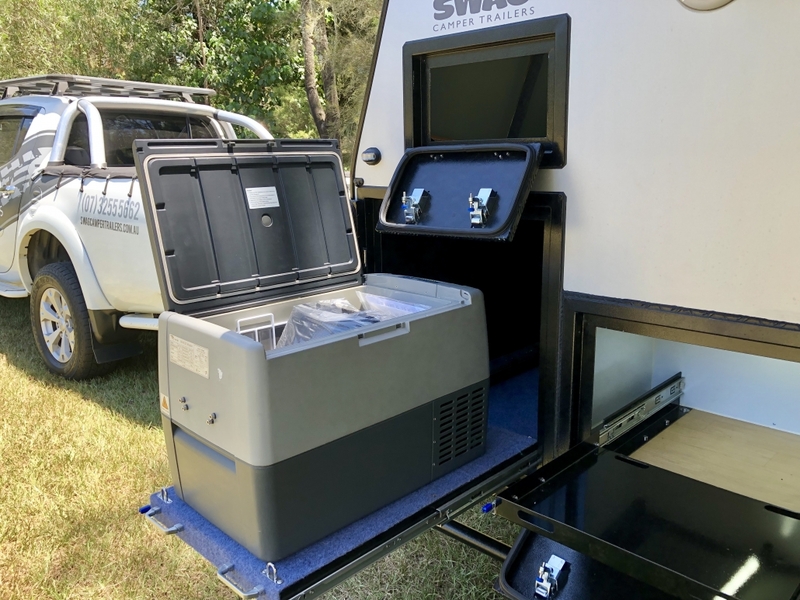 The X13 Explorer boasts plenty of internal & external storage as well as a nifty pantry slide next to the generous fridge slide (up to an 80ltr Evakool). 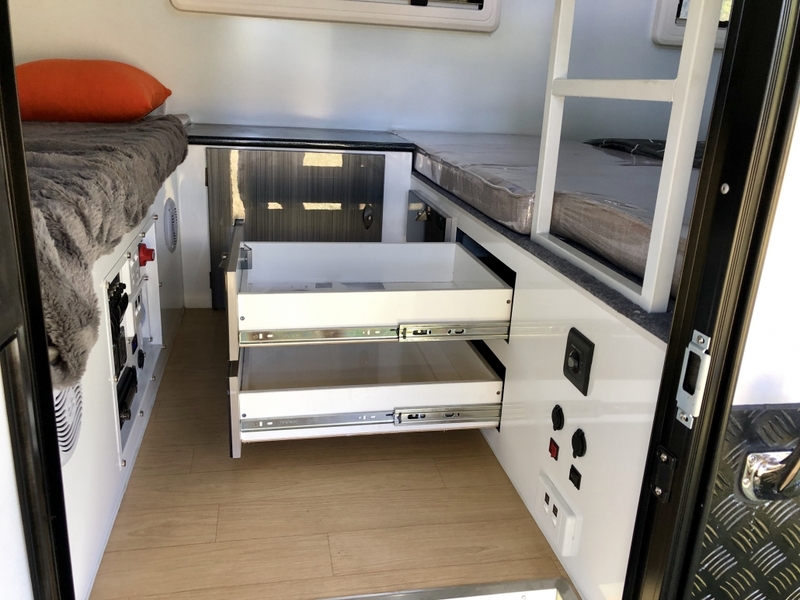 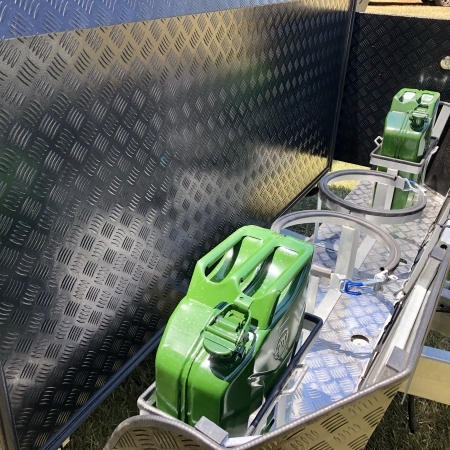 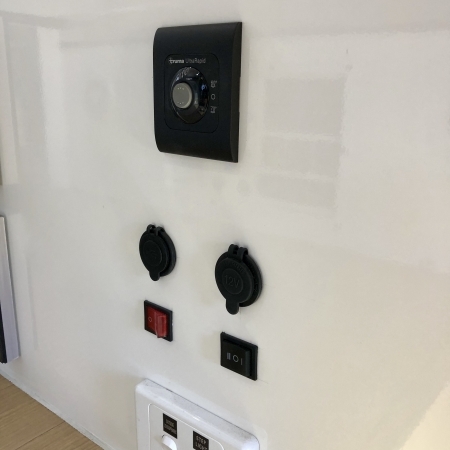 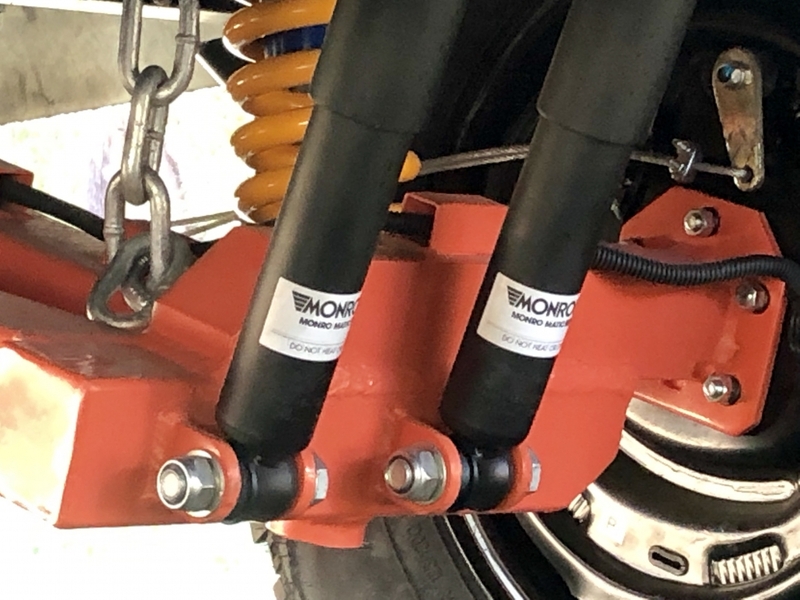 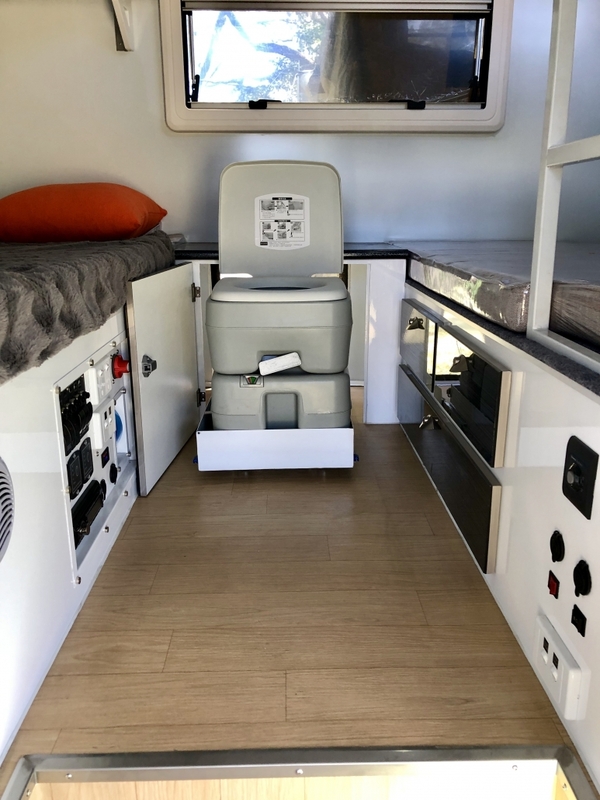 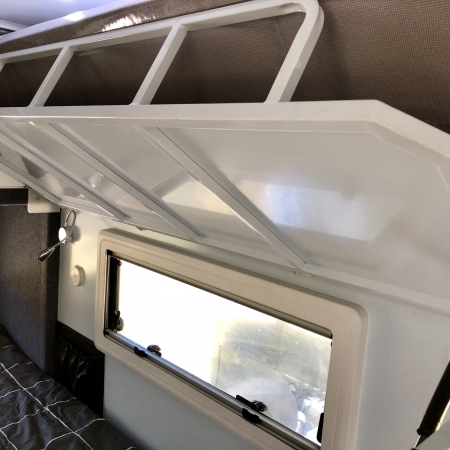 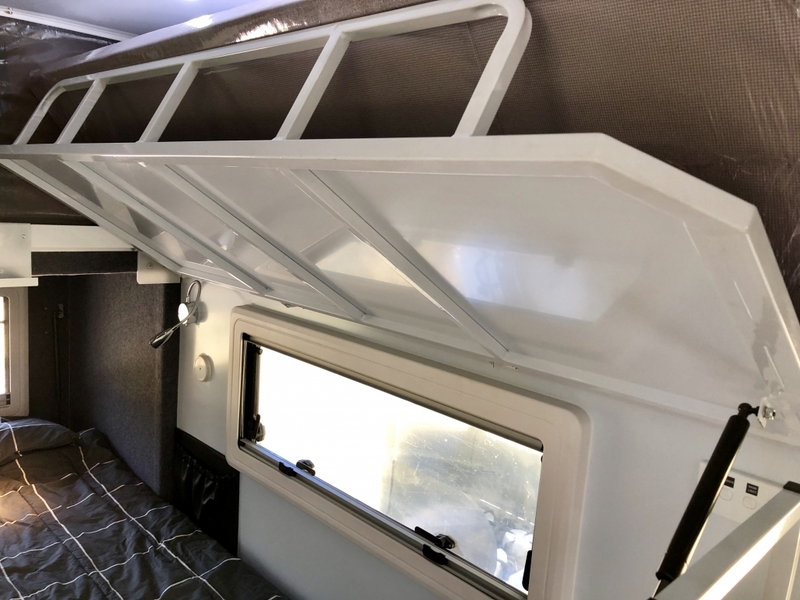 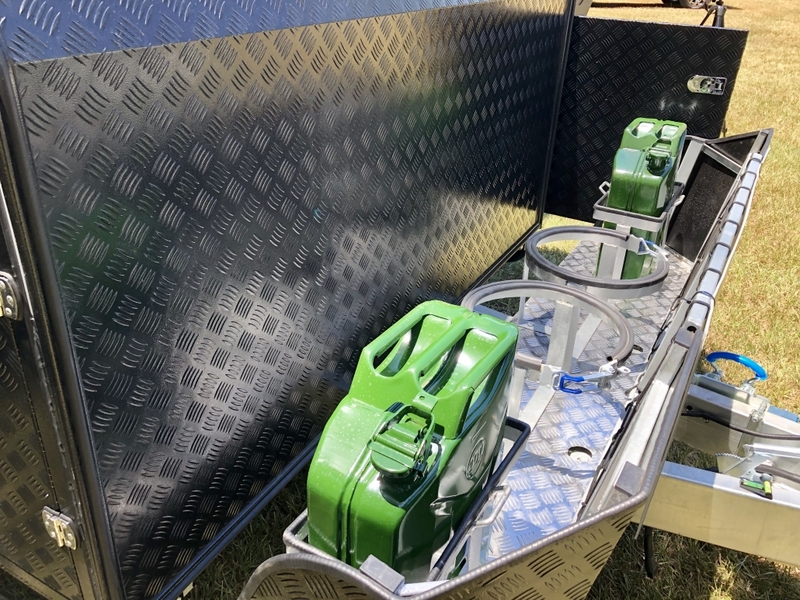 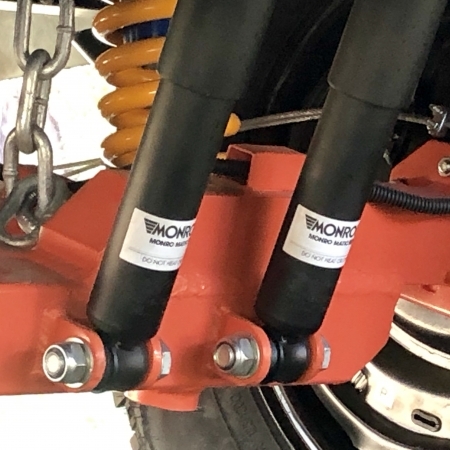 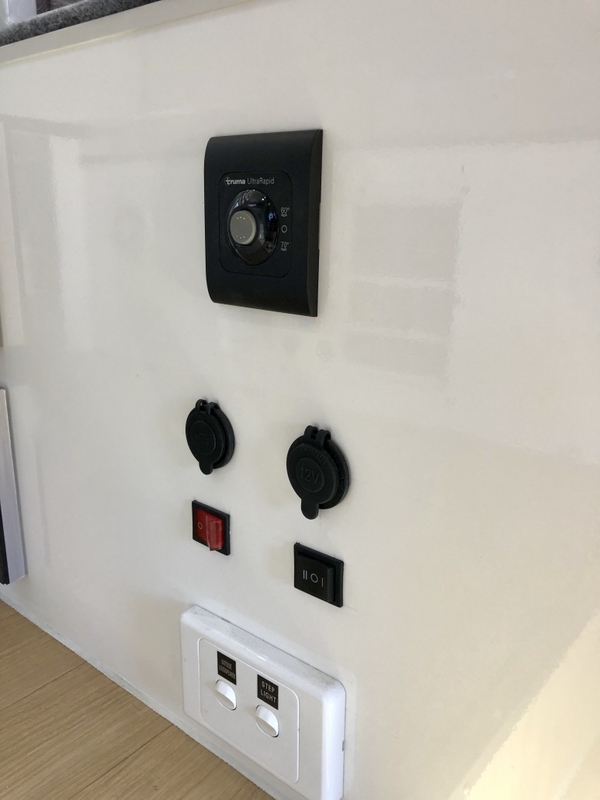 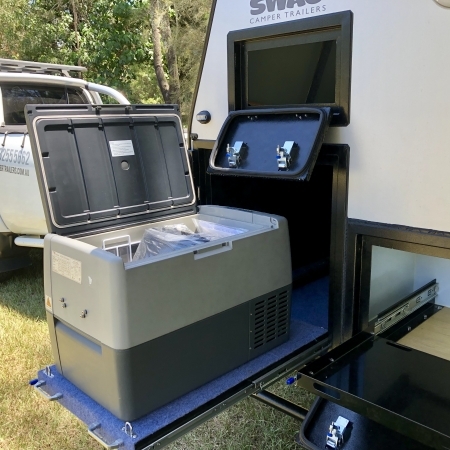 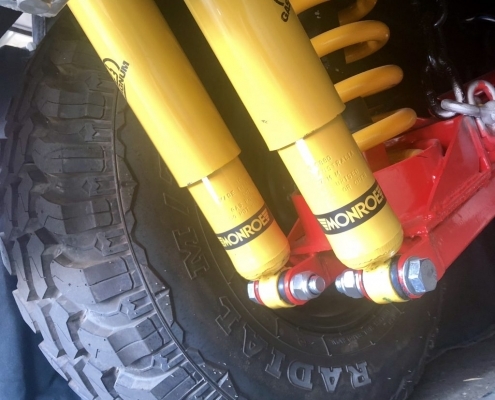 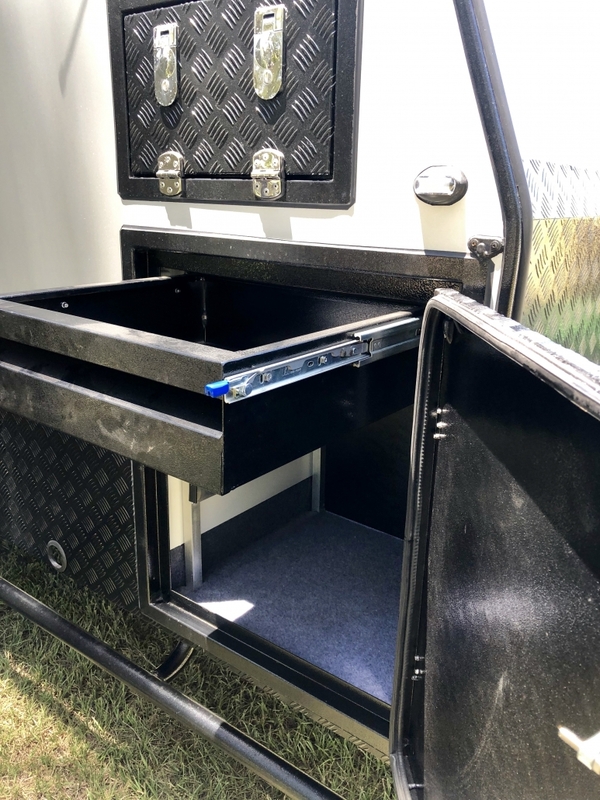 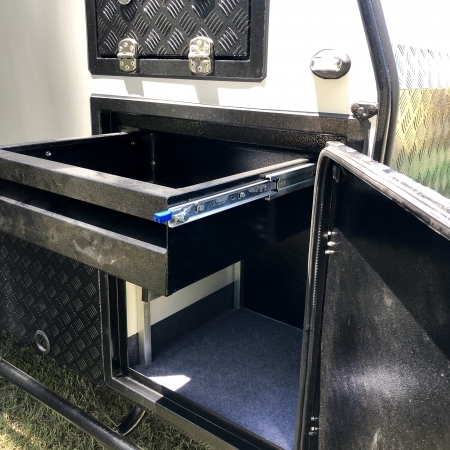 Depending on your requirements, the team at SWAG can fit your van with a dual fridge slide system for those extra long trips. 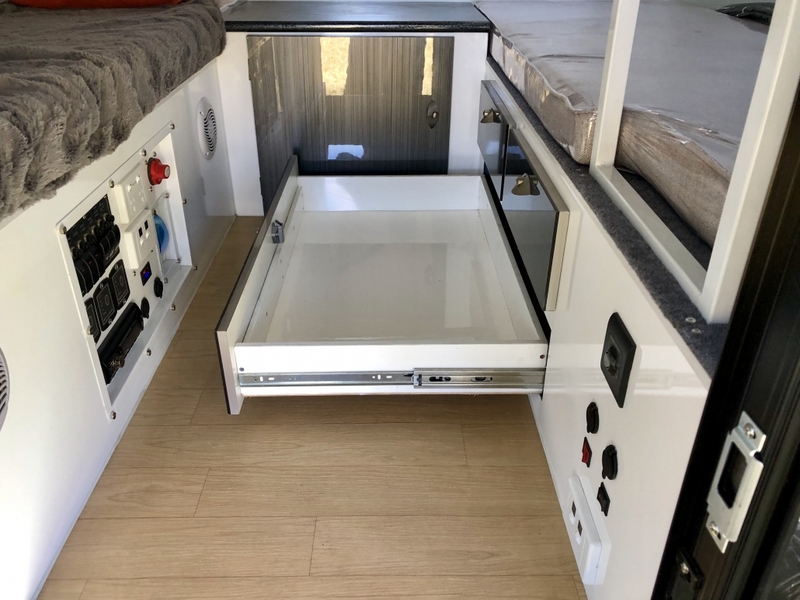 This beast has a built in TRUMA Gas hot water system and SEAFLO pump that are plumbed to the Kitchen and External Shower room. 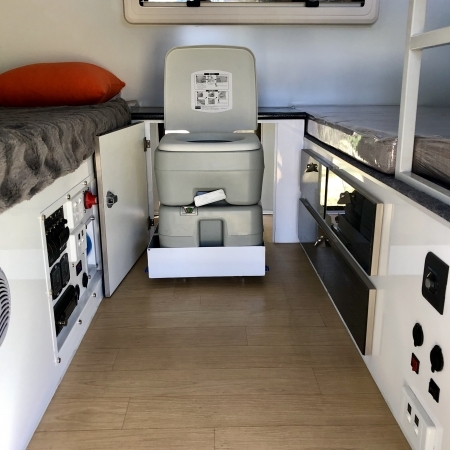 There is also a convenient toilet that is neatly disguised behind stylish panelling. 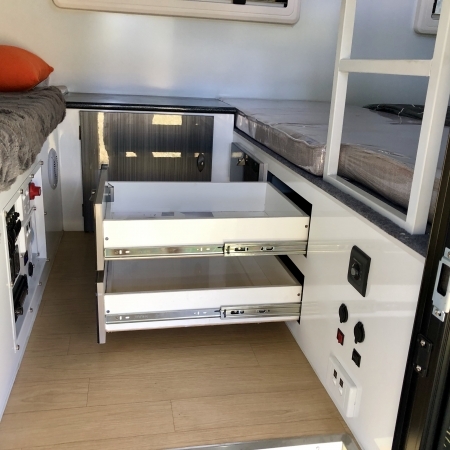 Up top, you will find 300watts of solar that feeds 3 x 100ah batteries and a 1000w inverter. 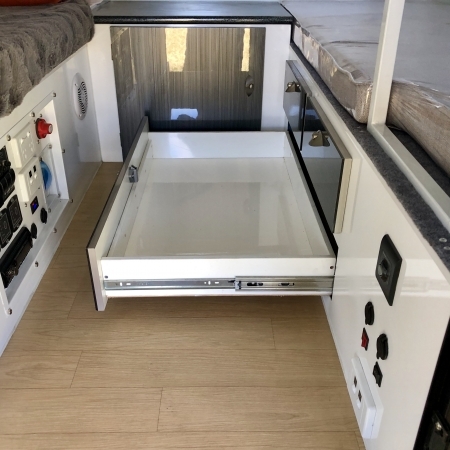 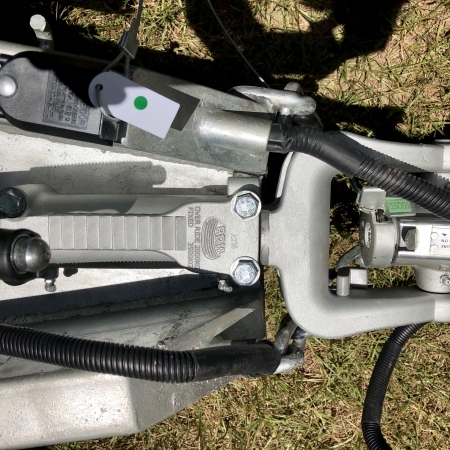 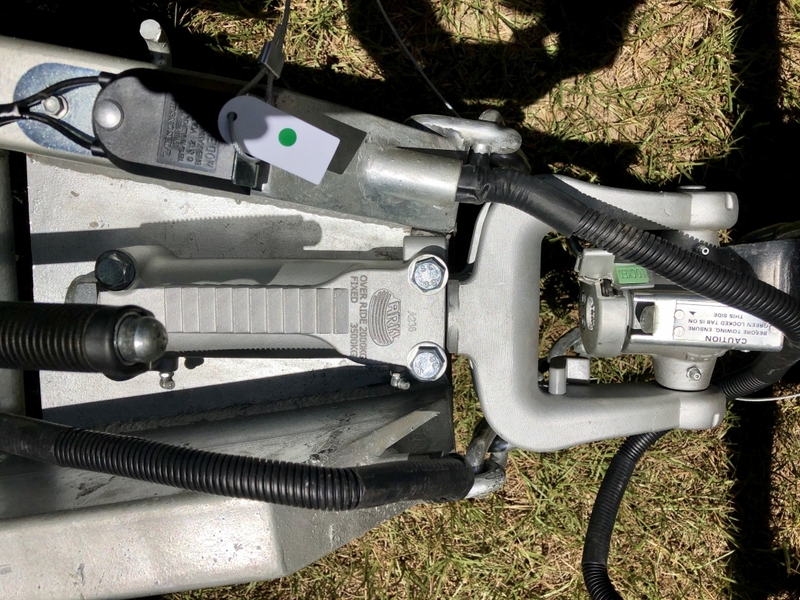 You can also elect to fit a DOMETIC FJ2200 reverse cycle aircon. 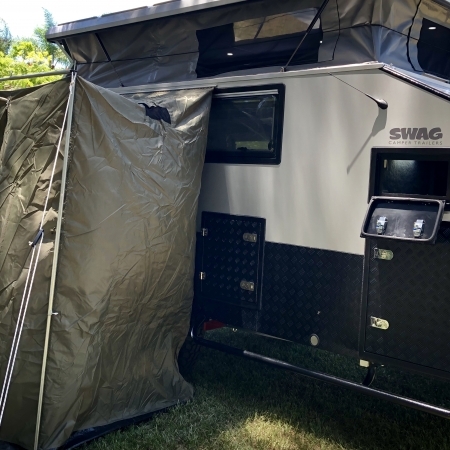 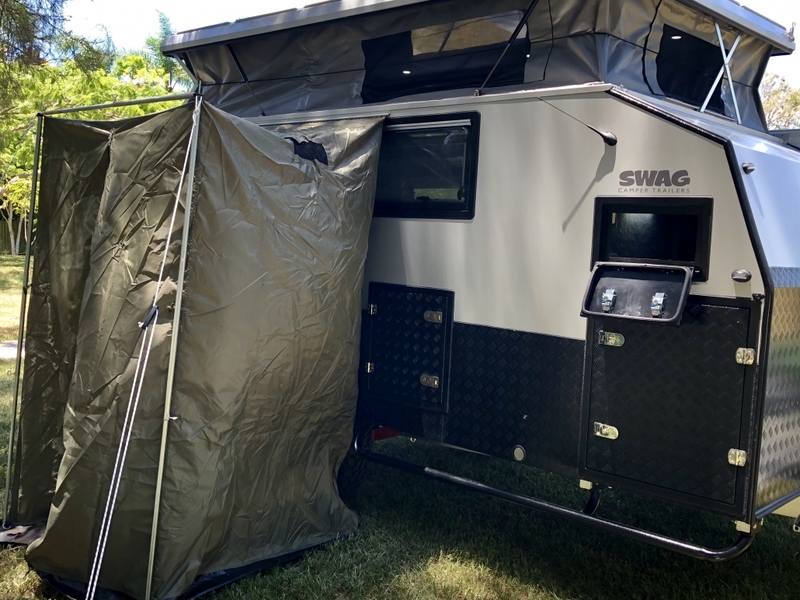 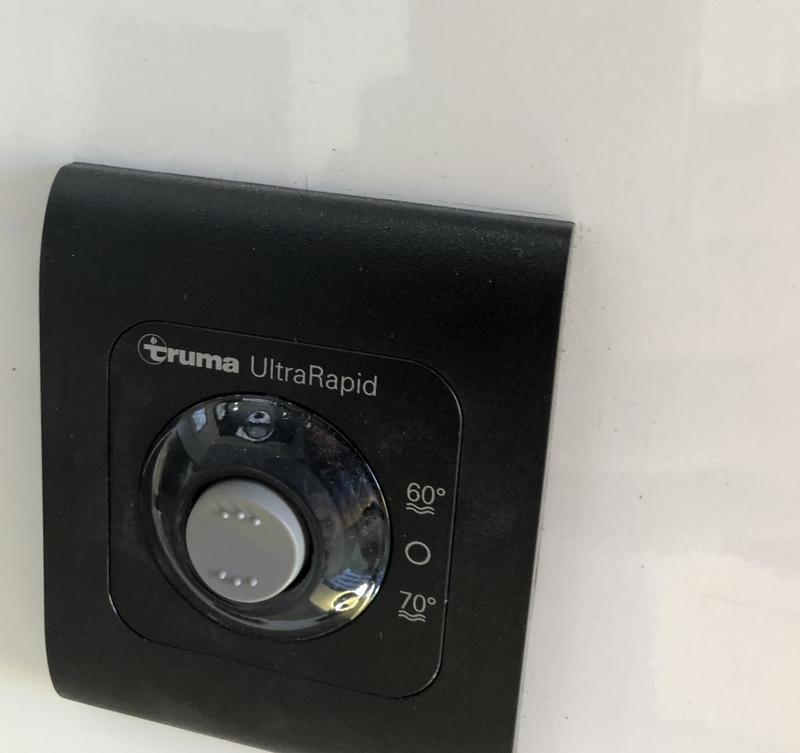 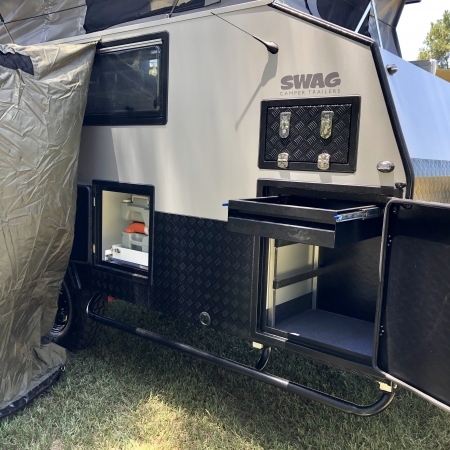 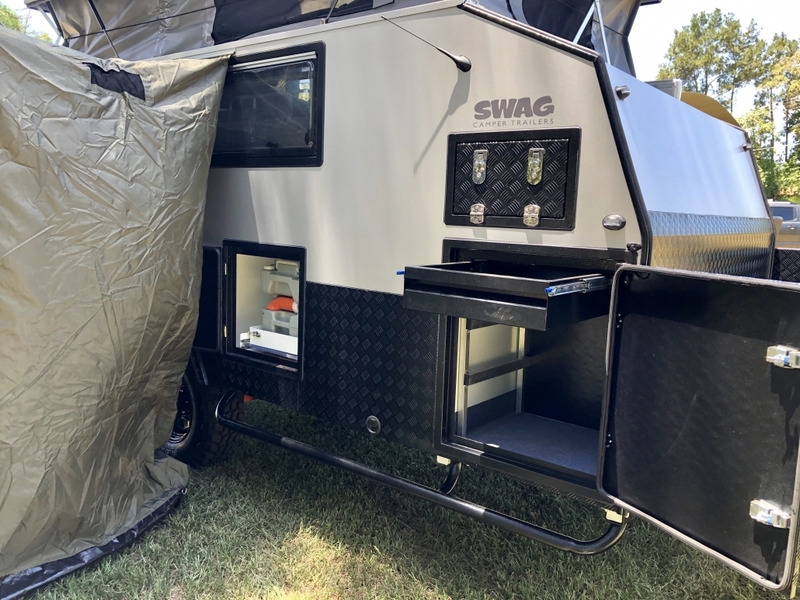 The new FIAMA Awning provides awesome coverage over the external Stainless steel kitchen and depending on your preference, the team at SWAG Can supply a range of different walls/privacy screens to suit. 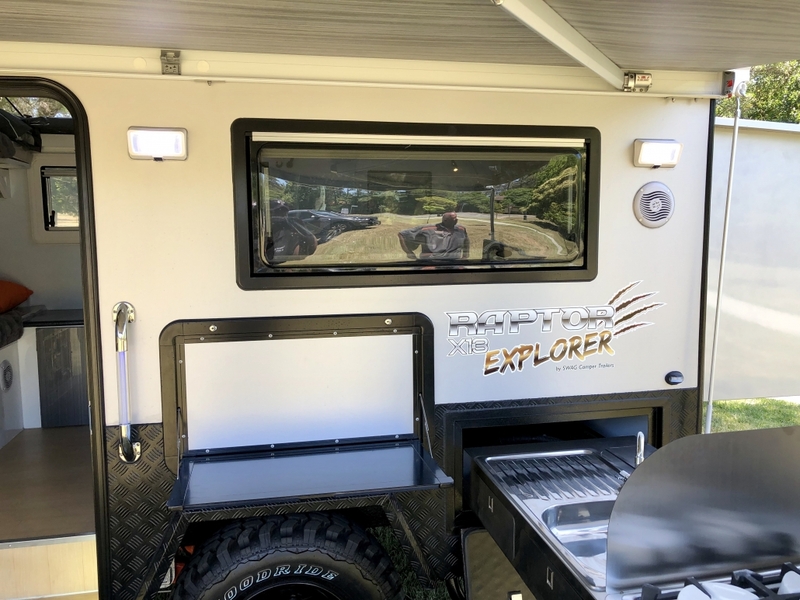 To summarise the Raptor X13 Explorer – it’s smart. 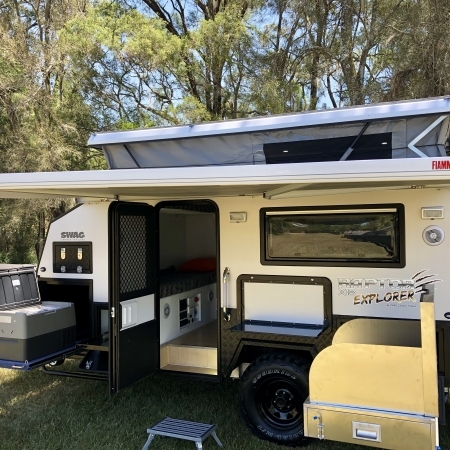 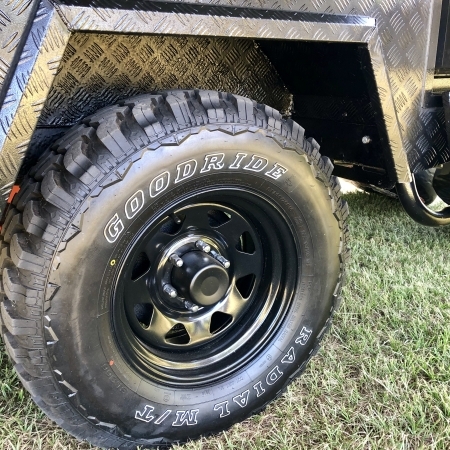 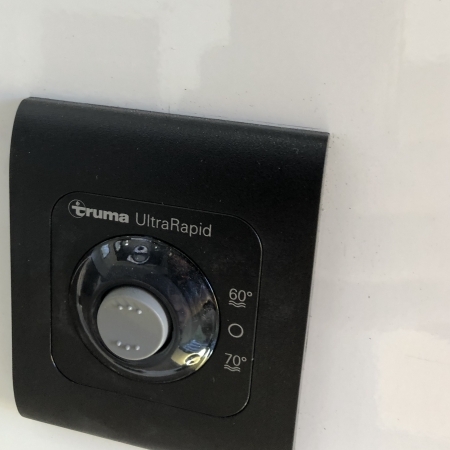 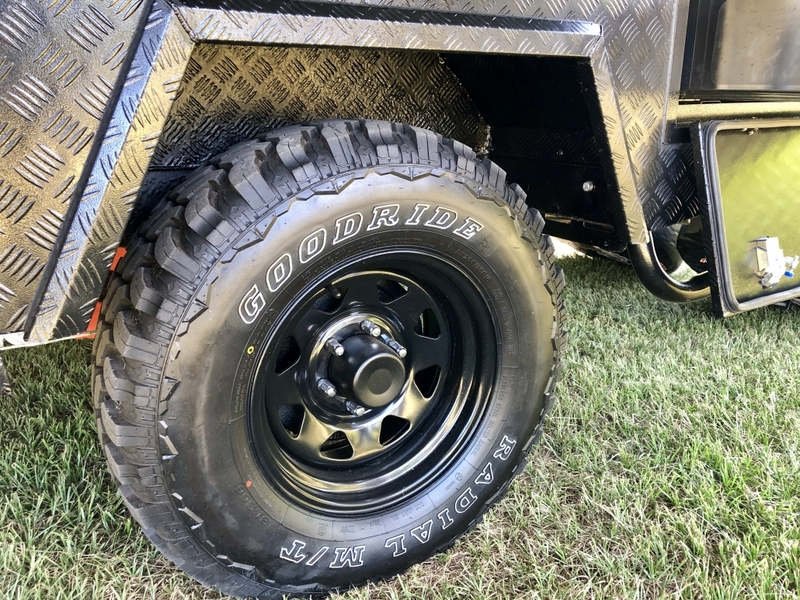 It ticks all the boxes on what you would expect in a Hybrid and with a price tag under $40k, it will no doubt be a hit with a large number of Aussie families . 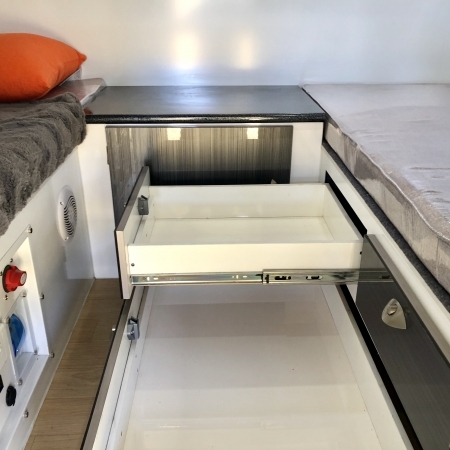 √ Pantry/Storage drawers and large front cabin as well as full size luggage bin above fridge section.